Aiwa was a well respected purveyor of high quality cassette decks, and until 1975 these came in top-loading format, as was the fashion back then. But by 1976, front loaders had become de rigeur as ‘rack systems’ with their acres of glistening brushed aluminium became all the rage. What then was Aiwa doing launching this, a brand new ski-slope design, which would have been the height of fashion back in, ermm, 1974! Sold as the AD-4200 in Japan, the AD-1250 uses a number of Sony components – which is no bad thing – likely taken from the company’s entry-level TC-118SD. That means a good basic frequency generator servo motor with belt drive and a decently sized flywheel. Aiwa Ferrite Guard Heads (FGH) are used, a variation on the theme of Sony’s F&F heads, and these are very long lasting indeed, although lacked the high frequency performance of the later Sendust heads which were needed when metal tape arrived, just a year or so later. The deck offered Ferric, FerriChrome and Chromium Bias and EQ positions, with a ±20% bias adjuster. This was relatively rare at the time and exotic stuff, as was the peak LED which was useful considering the slow ballistics of the rather mediocre VU meters! Round the back, a variable output level control was fitted, but that’s about as far as the Aiwa went for luxuries. 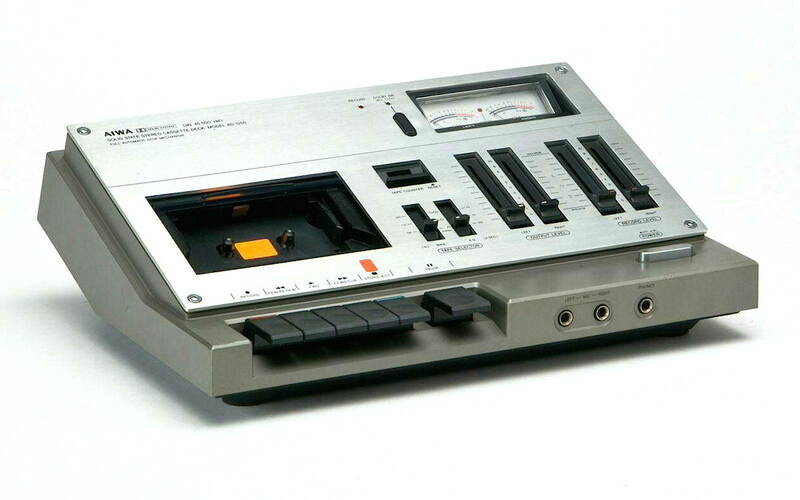 It looked fantastic (albeit no longer fashionable), with a large slab of brushed aluminium covering the control panel, but disappointingly the case was rather thin, painted plastic – had this been metal the Aiwa would have been one of the loveliest tape decks ever made. Another let-down was the plastic piano-style transport keys, which again felt cheap and lowered the tone a touch too much. There was also an option of a hinged dustcover, which seems to come fitted on all decks you see these days. The Recommended Retail Price back in the day was £150 in the UK, although by 1978 it was being discounted through retail outlets like Comet down to around £115. Sonically the AD-1250 is good, but not brilliant. Relatively easy to set-up, it runs smoothly and gives decent speed stability and a usefully wide frequency range, especially with Chrome tape. It’s crisp, punchy and fun to listen to, although you should be aware that it’s no Nakamichi CR-7E; ostensibly this is a lower mid-priced design that was well reviewed but is no giant killer. These days, they pop up for sale at anything from £10 to £150, depending on wear and condition. A nice machine then, but not quite as exotic as its looks suggest. Like most of the articles on this site, this is a very readable piece of fiction. In the UK, the term Hi-Fi can be applied to anything you like, because there is no defined standard for it. However, in Germany there is a standard, known as DIN 45500. The key attraction on this deck was that is was the first mass produced tape deck that met that standard. If you look on the attractive aluminium top plate, you will see the reference to DIN 45500. Hi Calvin – DIN 45500 was amended in the late nineteen seventies to allow Japanese manufacturers to apply for certification – and Aiwa took advantage of this. It was later superseded by European Standard EN 61035, I believe. Of course, having DIN certification doesn’t make it better than non-DIN certified machines; there were plenty of far superior sounding cassette decks to the AD-1250 that didn’t have it. Good to hear that you like the narrative style of the features.